He, however, said in one of the statements he made to the Department of State Services after he was arrested at a Lagos hotel on October 14, 2015 that he made the said comments in order to facilitate societal change. Kanu and two others have been charged with treason and other related offences on account of his agitation for the secession of the South-East and other areas of the country to form a sovereign state of Biafra. He confirmed in the statement, dated October 24, 2015, that he made the comments, calling Nigeria a zoo to justify his belief that the only language its people understood was violence in the interview with Sahara Reporters. He said he also accused Okorocha of Islamizing Imo State in the said interview. 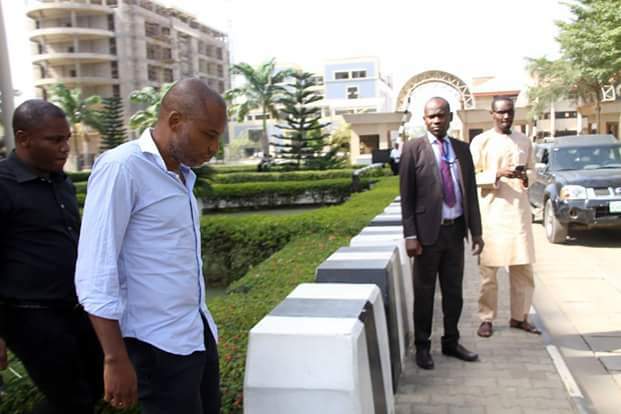 Kanu stated, “A Sahara Reporters’ interview was played by officers of the DSS on October 24, 2015, as part of my interrogation and I acknowledged that it was me that gave the interview and the answers I provided were done by me. “As I have earlier stated in past interrogation, the statements I make are purely designed to elicit reaction that will facilitate the desired change which is needed. “In the interview, I made reference and said, ‘the zoo has come to an end, they keep killing our people…’. “In the interview, I also said ‘the language the people hear in the zoo is violence. If they fail to give us Biafra, Somalia will be a child’s play’, yes, I stated that in the interview. “Again, I was asked (and I said), ‘If they do not give us Biafra, there would be no one living in the zoo,’ yes, I said so. He also denied belonging to Biafra Zionist Movement but admitted he believed in the group’s cause. “I do not belong to Biafra Zionist Movement. However, I stated my support for its action because it was a civil act designed to highlight societal injustice. “The said act involved a group of civilians massing at the Government House at Enugu to hoist the Biafran flag,” he added. The 48-year-old, who re-affirmed himself as the leader of IPOB, also gave an insight into the leadership structure of the group. Kanu said under him was Mazi Udanna Asiegbu. “(1) North America is represented by Mr. Nnamaram Ugochukwu; South America, by Leornard Aniemene, who is resident in Trinidad and Tobago. Mazi Asiegbu is resident in Spain and Clifford Iroanya, the Coordinator of Coordinators, is resident in Houston Texas, USA. Operatives of the DSS on October 14, 2015, arrested Kanu at the Golden Tulip Airport Hotel, where he allegedly checked into using a fictitious name. On December 23, the accused persons were scheduled for arraignment before a Federal High Court in Abuja, but Kanu refused to take his plea to the six counts of treason and other charges instituted against him and his two co-defendants due to what he called his lack of confidence in the presiding judge, Justice Ahmed Mohammed. The judge promptly returned the case file to the Chief Judge of the Federal High Court, Justice Ibrahim Auta, for reassignment to another judge and the three accused persons were returned to the custody of the DSS. The Federal Government, through the Federal Director of Public Prosecutions, Mr. Mohammed Diri, alleged in its summary of its case in the newly filed six counts that the IPOB leader checked into the hotel using the name, Ezebuiro Nwannekaenyi, in order to conceal his identity. Diri stated this in a document listing the proposed prosecution witnesses lined up to testify against Kanu and the two others. Apart from Kanu, one of the two other defendants in the six counts filed by the Federal Government is a Field Maintenance Engineer, David Nwawuisi, of Ericson, who maintains MTN masts in Enugu State. The other defendant, Benjamin Madubugwu, was said to be living in Ubilisiuzo, Ihiala Local Government Area of Anambra State, where he allegedly received custody of a container housing radio transmitters meant for Radio Biafra from Kanu. The fresh charges were filed against the three men barely 24 hours after Justice Adeniyi Ademola, in a ruling on Kanu’s bail application on December 17, ordered his unconditional release from DSS custody having been detained for about two months without any valid charges filed against him. No new date has been fixed for the arraignment of the accused persons.